Wichita. 1968. Gasoline is no longer allowed to be pumped into glass containers because of a rash of firebombs. A troubled 13-year-old boy is growing up in a racist white home. A black family moves next door. Fellow writer Tracy Million Simmons recommended this book to me and once I opened the book, I couldn’t close it. It’s a fascinating story. 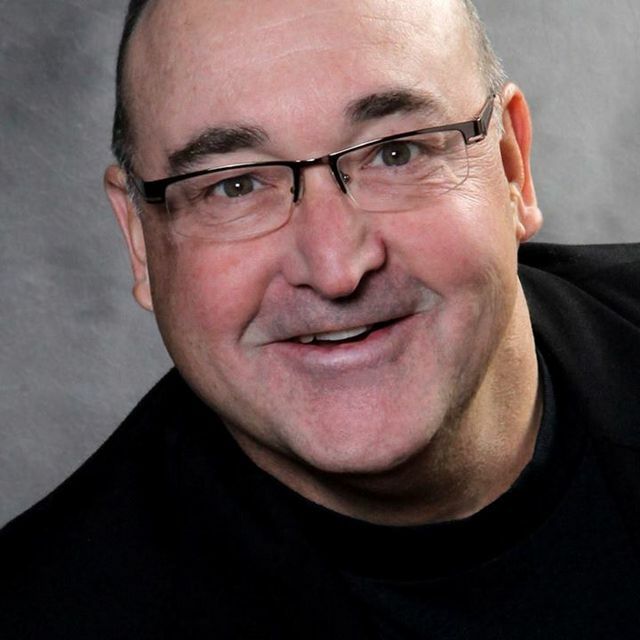 Grant Overstake of Wichita has written two novels, Maggie Vaults Over the Moon and The Real Education of TJ Crowley, both published by Grain Valley Publishing Company which he owns and operates. Hi, Grant – would you tell us a bit about yourself, about your career, your journalism background, the writing and creativity workshops you lead? I was born at Wesley Hospital in 1957 and grew up in the “troubled northeast side” of Wichita. At one point, we lived a block from the border line separating blacks and whites by discrimination, a setting that would become the setting for my new novel, The Real Education of TJ Crowley. I went to Buckner Elementary, Brooks Jr. High and Heights High School, where I had an excellent journalism teacher, Ed Thompson. I wrote for the Heights Highlighter and entered several writing contests. The phone rang at my house one evening. It was the Sports Editor of the Wichita Eagle & Beacon, Mal Elliott. He said, “I judged the sports writing contest that you won recently. Do you want a job?” Heck yeah! So, that’s how I got my first job at a real newspaper at 18 years-old. On my first day of work, a pipe-smoking editor called me over to see him. Awhile later, the editor called me over again. When I returned to the newsroom empty-handed, the reporters howled with laughter. I’d been duped. There was no such thing as a picture stretcher, or a left-handed pica pole. It was a newspaper snipe hunt. It was a thrill to see my stories in the same papers I’d been reading my whole life. I used my first paycheck to treat myself to a big steak dinner at the LazyR Restaurant. As I was chewing, I had an epiphany: I could feed myself with words! I worked at the Eagle and Beacon while earning a degree from Butler Community College, where I ran track and earned All-American honors in the decathlon. In 1978, I married my high school sweetheart, Claire Brewer, and we transferred to the University of Kansas. Claire had been a standout sprinter at Wichita State. As 20-year-old newlyweds, we became the first married couple to compete on the Jayhawks’ track teams. As a junior, in 1979, I placed 5th in the KU Relays decathlon and was looking forward to my senior year. But I was forced to forgo track to fulfill my scholarship obligations at the journalism school. I was heartbroken about leaving the team. Coach Bob Timmons called me up in front of the squad to shake my hand. “Now Grant isn’t the greatest athlete,” he said to no one’s surprise. “But he could wind up writing for Sports Illustrated someday. He doesn’t want to leave us, but it’s time for him to do what he does best.” That same year, a feature article I wrote as a reporter for The University Daily Kansan won the William Randolph Hearst Award, the college version of the Pulitzer Prize. The J-school thought I’d wasted my time and their money by running track, but I knew the experience would serve me well down the road, and it certainly has. My first job after graduating from KU was amongst the circle crops and tumbleweeds in far Western Kansas, as Editor of the The Johnson City Pioneer. It was like being on a National Geographic assignment. I wrote all the stories and took all the pictures. I bundled the papers coming off the press and took them to the post office. I went pheasant hunting in the milo fields and learned what the heck a wheat drill was. I was following the footsteps of small town Kansas newspaper editors like William Allen White. But I was too restless to stay in a town with one stoplight. In 1981, six months out of college, I made the leap from editing The Pioneer (about 1,000 circ.) to a staff writer’s post at The Miami Herald (about 2 million circ.). I was 24 years-old. It was a competitive newspaper market with five daily papers. We scoured the other papers first, to see if we’d missed a big story, at the risk of losing our jobs. I worked day and night. My wife was an early-rising school teacher, so we lived in different worlds. After four years in the race of daily journalism I took a position selling group health plans with Blue Cross & Blue Shield in Palm Beach County. Over the next few years, we had three children, born 16 months apart. Some of the reporters I worked with at the Herald became best-selling authors, including Carl Hiasson, Mark Ombascik, Edna Buchanan and Christine Brennan. Prioritizing home and family, we moved back to Kansas in 1988. I worked for Blue Cross & Blue Shield of Kansas City, where Claire and I volunteered at a Salvation Army soup kitchen. Serving the poor and needy opened our eyes to a greater good that we could do, so we sold our possessions and entered The Salvation Army seminary in Chicago for an intensive two-year training program. As interns we were assigned to the decrepit Henry Horner housing projects, which was an eye-opening experience. As new lieutenants, we were sent to command the operation at the Mississippi River town of Muscatine, Iowa, where we were greeted by the “Great Flood” of 1993. We devoted five years in The Salvation Army before returning to Kansas, where Claire went back to teaching. I spent five more years in ministry in the United Methodist Church, at Stafford, Leavenworth, and finally, the tiny farming community of Hiattville, in southeast Kansas, the setting for my first novel, Maggie Vaults Over the Moon. After a decade moving our brood hither and yon in itinerant ministry, we decided it was time to stay put long enough for our kids to attend Fort Scott High School together. I stayed away from newspaper work until our youngest child graduated from high school and then I dove back in, as Editor of The Hillsboro Star Journal. I wrote 56 weekly newspapers in a row, winning a dozen writing awards from the Kansas Press Association and two Golden Wheat Awards from the Kansas Farm Bureau. Writing stories about harvests, homecomings and hoedowns was a future author’s dream. That’s a long answer to your question, Cheryl, but like many authors, my life has been anything but ordinary. The good news is that I have a wealth of experiences to write from. 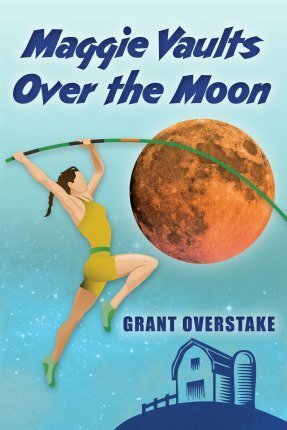 In your first book, Maggie Vaults Over the Moon, a high school girl and her family suffer a devastating loss after which she finds an unexpected mentor who leads her to an unexpected sport: pole-vaulting. How did this story come to be? Do you have an interest in track-and-field, or pole-vaulting specifically? I’ve been pole-vaulting since I was a little kid, so track and field is fertile ground for my storytelling. I’ve discovered through the years that the events in track often reflect the people who do them, not unlike people who look like their dogs. For example, grief-stricken Maggie Steele is a gritty teen who discovers that the daring sport of pole-vaulting is her path to personal healing and a higher perspective on life. In the same way, the volatile TJ Crowley discovers shot putting is the perfect place for him to channel his fiery temper. My characters learn life lessons through the crucible of competitive sports. Maggie has become a cult classic in the world-wide pole-vaulting community. Olympians have endorsed the book and coaches have purchased copies to inspire their young vaulters. The story was named “National Book of the Week” by BookWorks. Audie Award-winning voice actress Tavia Gilbert earned top reviews for her audiobook performance of the story from AudioFile magazine. And, Maggie was picked as a “Too Cool for School” read by Publishers Weekly. I present school assemblies called “Don’t Quit, Use Grit!” using pole-vaulting and Maggie’s resilient character as a jumping off point to talk about “famous failures” like Edison and Einstein and Oprah, to encourage youngsters to get back up and try, try again. Would you give us a brief summary of your second novel, The Real Education of TJ Crowley? The Real Education of TJ Crowley is a coming-of-age story set in segregated Wichita, Kansas during the racially turbulent years of 1968 and 1969. The story is told in first-person by a volatile white teenager from a racist household who is forced to choose sides after a black couple and their daughter cross the line and move into the house next door, unaware that the Crowleys are a bigoted brood with ties to the Ku Klux Klan. The Real Education of TJ Crowley shows me you’ve grown as a writer. The story and characters are much more complex than in your first novel, and the main theme of the book is race/racism, which in itself is a very complex issue. As you wrote The Real Education of TJ Crowley, could you feel yourself stretching as a writer? How did it feel to be tackling such an important topic? It was a harrowing experience to be writing about racism while white supremacy was on the rise. But it was a story that I had to write, because it was my story to tell. I grew up in a racist family. We lived a block from the dividing line, we had a vacant house for sale next door to us, just like in the book. When a black family moved into that house one day, my mom went berserk, just like in the book. I’d like to say that we stuck around and had a great cross-cultural experience with our new neighbors. But the truth is that we didn’t stick around to find out who those people were. We put up a for sale sign and moved to an all-white neighborhood a mile away, without ever knowing their names. So the story was there for me to write. But I needed to do a lot of research. Characters in the book are fictional, of course, but because you yourself had a black family move into your white neighborhood, you did have solid personal experience to draw from – at least from a white kid’s perspective. What kind of research did you do to learn about the black experience? This book would not have been possible without the support of many wonderful black folks in Wichita who shared their life experiences with me. Especially Dr. Val Brown, Sr., and his wife, Josephine. For 47 years, he practiced medicine at 17th Street and Hydraulic in Wichita, treating more than 8,000 patients until his retirement in January 1995. “Mama Jo” Brown was the first black woman elected to the Wichita Board of Education. She also founded the acclaimed ARISE Ensemble, and invited Claire and me to sing with the group. The idea for the story came to me when the Browns hosted the ARISE Ensemble Christmas party. Walking into their house was a stunning experience for me as a white guy who considered himself an ally. But I discovered that even though I thought I knew, I didn’t really know anything about the lives of black people. I realized that I could move the Browns into the empty house next door and write about them, as the Washingtons. In subsequent visits, the Browns agreed to participate in the story. They gave me a grand tour of their house, which is filled with amazing photos and artifacts, and I recorded our conversation as they shared their remarkable lives with me. The Browns were extremely helpful. I also received a lot of really great help from Dr. Gretchen Eick, the historian who wrote, Dissent in Wichita, the story of the Civil Rights Movement here. The Dockum Drug Store sit-in happened here in Wichita, so it’s a historic town in the Civil Rights era. We had a lot of racial strife with fair housing and discrimination; busing and school integration, just like in the book. There’s a rawness to this story, we’re really exposed to harsh sides of human nature. The story is told exclusively, I believe, in TJ’s voice. We learn about who Uncle Ray is as TJ learns about him, bit by bit. As readers, we see a little more of what’s coming than TJ perhaps, but I think you did an extraordinary job of keeping the story and the revelations on TJ’s level, from his perspective. When you were writing, did you really have to watch that perspective, to not let too much information out too quickly, in order to maintain the perspective of a 13-year-old? Some readers expect the story to be like “The Wonder Years” when it’s more like “The Wonder Years” meets “Mississippi Burning”. It’s real and it’s raw. But in discussing the story and language with my beta-readers, especially black beta-readers, I heard time and time again not to sugarcoat anything. The first manuscripts were rougher. We toned down the language in the final version so the story could be read aloud in middle school and high school. Keeping TJ Crowley in the dark early-on is more realistic because that’s how kids are. He’s hard-headed but manages to wake up to the point where, when the time comes, he is ready and willing to go against his family and risk his life to stand up for what he comes to believe in. Maggie Vaults over the Moon is a YA book, as is The Real Education of TJ Crowley, although I think the latter could easily also be marketed as literary fiction. Is this your preferred niche, YA books? What I’ve learned is that the YA label doesn’t mean a story was written just for teenagers; but rather, the YA label indicates that the protagonist in the story is a teenager. This is true in both of my novels. Adults might play a role in YA stories but the focus is always on the teenage characters. Young Adult stories often appeal to older adults, who can relate because they were once teenagers themselves. The niche we decided on was realistic, historical, YA fiction. In your earlier years, you did a lot of writing as a journalist, a newspaperman. When did you begin writing fiction? I started writing fiction in 2010, after we moved back to Wichita. Claire won the Presidential Award for Excellence as a science teacher, the highest award in the nation. So she got to pick where we moved to next and she said she wanted to come back to Wichita to be closer to our kids and her parents. So “Mrs. O” got a job teaching 6th grade science at Stucky Middle School and I had a yearning to write a novel. So we downsized to so we could afford to live on her income. I thought I was going to need formal education to learn to write fiction, and I was accepted to a Masters of Fine Arts writing program. But, after reading On Writing by Stephen King, I decided against grad school. King argues that an MFA isn’t really necessary, if you do your homework. So as I began to plot out my first novel, I was studying how-to books on fiction writing, earning a home-school MFA if you will. There is craft to storytelling which includes a subtle framework that readers subconsciously expect in novels. The best way to learn is by doing. After I wrote Maggie I promised myself I wouldn’t second guess myself or be too critical of my first effort. But the second novel was a different story. It was an opportunity for me to apply what I’d already learned and then some. My first novel is simple and direct, 222 pages. The second is complex and layered, 364 pages. Now I still don’t know what I don’t know about writing fiction and I don’t know if my work could survive MFA-level scrutiny. But I really don’t care so much about that. It’s only my second novel. I am still learning. 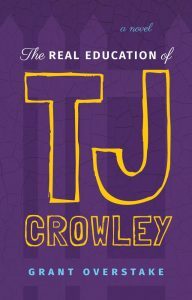 In so many ways, The Real Education of TJ Crowley has been a real education for me, too. Are you working on another project? I have some ideas for new novels, but marketing TJ Crowley is getting all of my attention right now. The book has been endorsed by local historians, such as Dr. Jay Price at Wichita State University, and by national social justice folks, such as Mark Potok, former Sr. Fellow at the Southern Poverty Law Center. It is on the reading list for the Kansas History class at Newman University this spring, taught by Emily Williams. It looks like the novel will find its place in social studies classes where students are studying the Civil Rights Era. I’ve posted helpful teachers’ guides for middle and high school classrooms and plan to add discussion guides for book clubs, churches, and other groups at grantoverstake.com. We hope the book will spark candid discussions about race and white privilege. So far, so good. Is there anything else you’d like writers and readers to know about you or your work? Yes, I want to thank you and everyone at the Kansas Authors Club who have so warmly welcomed me to their community. It was an honor for me to present a program on the pitfalls of cultural appropriation at last year’s state convention. I look forward to the state convention in Wichita later this year, because Newberry Award winning author Clare Vanderpool is scheduled to speak! Clare came to my author’s talk for Maggie at Watermark Books several years ago. Luckily, I had no idea she was in the audience until she came up with a copy of the book for me to sign. Wow, what a moment. It was so kind of her to show up! I’m grateful for the support I’ve received for my work from Kansas authors. I look forward to returning the favor as time goes on. Thanks for the interview!